No one likes seeing an injured animal. But what can you do if you come across one? Wild animals can be dangerous; both to people and to themselves, when in a heightened state of terror from pain. So what do you do if you come across a wounded wild animal and want to help? It’s not a good idea to try and handle the animal right away; this causes them additional stress and, if capable, they will lash out. The additional stress can also exacerbate their condition. Instead, the first thing you should do is try and create a space around the animal free from other animals or people. Chase off potential predators, and if you can set up a formal perimeter so that people know not to go close, do so. If the injury is on, or near, a road, then blocking the road to the animal and diverting traffic around it is an important first step. Each state and territory in Australia has its own organisations to contact about wild animals. Before trying to interact with the animal, give these organisations a call and discuss with them the immediate situation. Depending on the conversation that you have had with the relevant authority, it may now be determined to be safe to move the animal, or at least provide it with some shelter. It’s best to get the animal into a dark, dry place. It helps if you can get it into a box with a blanket for comfort and warmth. 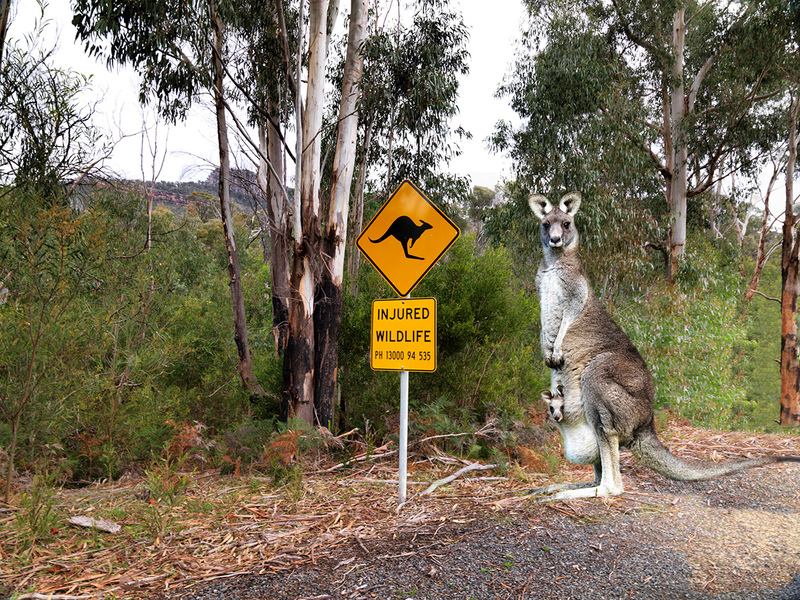 Under no circumstances approach the following animals, regardless of their state; snakes, monitor lizards (goannas), bats (flying-foxes and microbats), large macropods (kangaroos and wallabies) or raptors (eagles, falcons or hawks). Remain at a safe distance to monitor the animal, but wait for specialist care to arrive on scene to attend to it. A mistake that’s very easy to make is to leave the animal some food and water. In practice, wild animals have diets that are incompatible with anything you’ll have in the kitchen (fruit and vegetables have been treated for consumption by humans), and feeding an animal in shock can, in fact, kill it. If it is safe to feed the animal, this will be mentioned in the conversation that you have with the relevant authority. After being treated by the wildlife authorities and/or vets, the animal will need to be released back into its territory, so make a note of where this location was to pass on to whoever is helping the animal recover. Regardless of what you think of your abilities to care for the animal, you need to have an OEH Wildlife License to be able to look after a wild animal. To care for one without such a license is illegal, and you can be prosecuted for it. It goes without saying that you are not able to keep a rescued animal as a pet. The final step, if it’s safe to do so, is to take the animal to the local vet. Don’t worry; vets won’t charge people who bring them injured wildlife. If you’re unsure if the animal can handle a car ride, then find a vet that’s available to come out and look at the animal on the scene. It might be that the wildlife authority recommends that you do that anyway. Finally, stay calm through the process. Injured animals are sensitive to tension, sudden movements, or loud noises. Whether you need to handle the animal, or just observe it from a distance, keep your movements slow and calm, and moderate the volume of your voice. That way you give the animal the best chance that it has to stay calm and get the help that it needs.